Finance Minister Bill Morneau speaks to members of the media as Prime Minister Justin Trudeau looks on at a press conference on tax reforms in Stouffville, Ont., on Oct. 16, 2017. 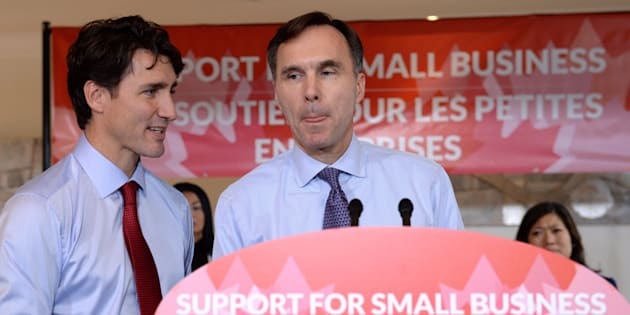 OTTAWA — Prime Minister Justin Trudeau refuses to say when he found out that Bill Morneau never put his substantial assets into a blind trust after being appointed finance minister two years ago. Trudeau accuses opposition parties, who've intensified their attacks on the finance minister, of playing gutter politics over the issue. And he says he has faith that both Morneau and ethics commissioner Mary Dawson followed all the requirements of the Conflict of Interest Act. At issue is an estimated $40 million in shares that the minister still owns in Morneau Shepell, a human resources and pension management firm originally started by his father, and which he is now responsible for regulating as the minister of finance. In 2015, Morneau said he expected he'd have to place those holdings into a blind trust but it was revealed this week that Dawson advised him that wasn't required because the shares were indirectly held through private companies — also owned by Morneau. Conservative MPs are demanding that Trudeau explain when he found out Morneau was still managing his own financial fortune at the same time as he was regulating the industry; but Trudeau has dodged all their questions.